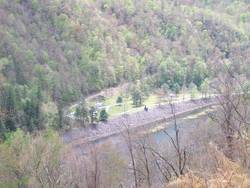 Description: ocated at the base of Fontana Dam and is in a very scenic mountainous location of Western North Carolina. Campground is poorly maintained and the power voltage while we were there was low at 104 volts. Grass was not mowed until we complained. Rates were $35 night for water and electric. No sewer but there is a poorly maintained dump station that had no water. Cons: Poorly maintained, low voltage, overpriced. Poorly maintained, low voltage, grounds not maintained, overpriced. Management unresponsive to complaints regarding low 104 volt power. Very scenic location, could be a great CG if properly maintained.